While watching the news this morning I saw the local weather prediction for next week. They are saying that this time next week the low temp is going to be somewhere around 16 to 18 degrees, and while colder than average, I shouldn’t be surprised since winter starts in about 6 weeks. According all the meteorologists this is going to be a pretty hard winter for the midwest, and rather than hating it, I’ve decided to try to embrace it. So what is the best way to embrace old man winter when you’d rather be someplace warm and sunny? You combine something like surfing with snowboarding with the ultimate ride. 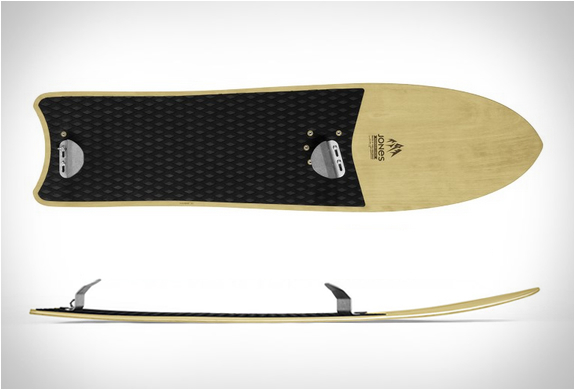 The new Mountain Surfer by Jones Snowboards is designedby renowned San Diego surfboard shaper Chris Christenson. Mountain Surfer is a hand shaped, all wood snowboard that forgoes traditional bindings for removable hooks that you can choose to use or not. The hooks allow the rider to push their boots into which helps improve board control while keeping the board locked to your feet. At the same time, if you are an advanced powder surfer you can go naked with no hooks and try and get that real wave riding feeling like you are really surfing the side of your favorite mountain. The Mountain Surfer also features a foam traction pad for extra grip, and a leash to keep your board tethered to you for that occasional wipe out. Posted in Pure Fun. and tagged Jones Snowboard, Mountain Surfer, Mountains, Snowboard, Snowboarding, Surfing, Winter, Winter Sports on November 6, 2014 by Author.